First off, congratulations. I’m sure Michelle and the girls are very proud, as are the rest of us American citizens, and I suspect all citizens of this fine planet. That said, I do feel compelled to write as it has now been more than 24 hours since your inauguration and it is still not raining sugar plums. It was my understanding that it would begin to rain sugar plums immediately upon your taking the Oath of Office. Also, I was under the impression that all of my dirty dishes would be cleaned, my laundry would be folded, and that the unruly pile of bills I keep by my front door would be neatly organized (and paid). Someone mentioned something about how I’d also begin to defecate roses, but that seems entirely unnecessary, and also a bit uncomfortable. (I have some gastroenterological issues, though this is probably not the best place to discuss them.) Anyway, I’m sure the economy and Iraq and Afghanistan and a million other things have you occupied, and believe me, I’m sympathetic to your demanding schedule, but I was still wondering if either you or someone on your staff might let me know when I could expect the sugar plums. 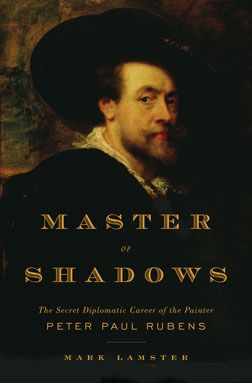 Behold the cover for “Master of Shadows,” which releases this coming October. You’ll excuse me if I suggest it works beautifully; credit and major thanks go to designer Emily Mahon. The self-portrait, from 1623, was done at the request of King Charles I, of England—a Rubens fan. The artist was initially reluctant to paint it; he generally avoided self-portraits, and thought it immodest to send his own portrait to a king. There was no refusing Charles, however, and it’s a good thing. The picture is now a part of the royal collection at Windsor. The Baltimore Ravens look pretty formidable going into the AFC Championship game, but I wonder if this squad from Charm City could give them a run for their money. The offense looks a bit sketchy, but the defensive unit is stacked with stone-cold killers. You wouldn’t want to be a receiver going over the middle against that secondary, that’s for sure. “Just how much personal history do we require to truly understand an artist’s body of work?” That’s the question that launched my review of Nicholas Fox Weber’s biography of the architect Le Corbusier, which appears in the latest issue of Print. The more we get to know an artist, the better we appreciate their work. That Caravaggio and Rembrandt, Van Gogh and Pollock were famously tortured souls only makes their work more powerful, or at least emotionally engaging, for modern audiences. Architecture, a craft as much as an art, is a bit different—it is at once more abstract and less transparent. To paraphrase my review, you don’t need to know the details of Le Corbusier’s relationship with his mother to appreciate the radical nature of the Villa Savoye, nor can you easily detect the contours of that relationship in the villa’s white-washed planes. Le Corbusier went to great lengths to shield the public from his private self, and it was a good thing too, for he was no angel. I can’t help but compare him to Peter Paul Rubens, the enigmatic subject of my own biography. Their personalities could hardly have been more different—Rubens was beloved by just about everyone who knew him, and dedicated much of his life to public service. Although knowledge of his personal biography is not essential to those who would understand his work, it is virtually impossible to fully grasp it without a grounding in the political and historical moment in which it was created. I think this is why we find the brooding Rembrandt to be so much more popular today than Rubens. In their own time, it was a different story. Just how much of an outlier is Alex Rodriguez? I pose the question over at YFSF. I recently contributed an essay to a series celebrating the final year of Yankee Stadium on the website Bronx Banter. I’m in distinguished company: Jane Leavy, Pat Jordan, Bob Costas, Joe Posnanski, Rob Neyer—more than sixty of us altogether. It makes for great reading. One thing that has struck me in following the series is how formative the bleachers, the subject of my piece, have been for so many of the contributors. The opportunity to sit in cheap seats close to the field, and to become a part of a community is very special. One of the things I find most troubling about the new ballpark is that this opportunity will be dramatically compromised. The new bleachers will be more expensive, separated from the field of play, and some seats will come with obstructed views. This is all part of the evolution of professional baseball from sport to entertainment event. I don’t know what this will mean for the next generation of baseball writers—we might already be seeing it in the detached, pitilessness “snark” that marks the worst of web writing and yellow journalism. Reap what you sow. The J-E-T-S spent $75 million this year on a state-of-the-art new training facility designed by Skidmore, Owings & Merrill, but they may still miss the playoffs, after a string of losses to close out the season. Brett Favre, the consummate football throwback, seemed an odd fit for this team devoted to technology from the moment his signature was announced. My review of the Atlantic Health Jets Training Facility appears in the latest (Jan./Feb.) issue of ID Magazine. I wasn’t the only writer to note the disjunction between Favre and the Jets’ organizational obsession with technology. Jeff MacGregor addressed this in a superb profile for the now defunct NYT sports magazine, Play. Update: The Jets did miss the playoffs, in typical Jets fashion. Favre may or may not be back.